House of Comedy in Phoenix is Rick Bronson's fourth comedy club and the first of his clubs in the Southwest. It opened in September 2014. It is the only comedy club in north Phoenix, and, as a matter of fact, one of few entertainment venues in the far north part of the Valley of the Sun. Located at a mixed use development called High Street, Rick Bronson's House of Comedy is easy to get to if you have a car, and parking is free (valet usually available). Within a block or two you will find upscale dining, casual dining, bars, coffee and dessert. That makes it easy to enjoy an entire evening at High Street, without even moving the car. 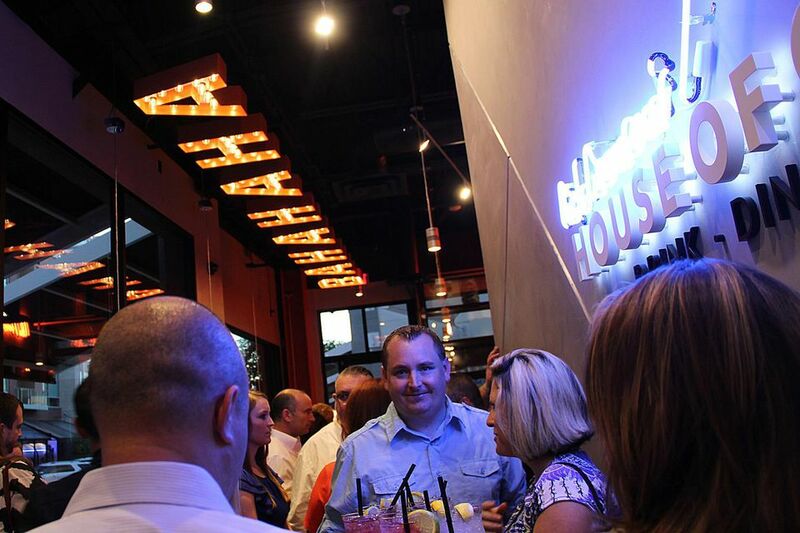 House of Comedy features both local comedians and big-name, nationally known stars. All genres of comedy are covered here -- clean, not-so-clean, Latino, blue collar and more. Early shows at House of Comedy are 18+, late shows on weekends are 21+ only. Open mic "Hit or Miss" on Tuesdays. One show on Wednesdays, typically at 7:30 p.m.
One show on Thursdays, typically at 7:30 p.m.
Two shows on Fridays: typically at 7:30 p.m. and 9:45 p.m.
Two shows on Saturdays: typically at 7 p.m. and 9:30 p.m.
2. At the box office, seven days per week. 3. By phone to the box office, 480-420-3553. House of Comedy has a full food and beverage menu, featuring poutine and cheese curds -- Rick is part Canadian, part Arizonan! You'll also find flatbreads, burgers and salads. There is no drink minimum at this club. Both nationally and internationally known comedy stars, as well as local aspiring comics, appear at Rick Bronson's House of Comedy. Before you buy your tickets, here are ten things you might want to know. Parking is free at High Street in the garages. This is an intimate club, and all seats offer a good view of the stage. There is no balcony here; all seats are on the main level. The seating is arranged giving just enough space for people to move their chairs around to face the stage, but it isn't easy to get up without your chair banging into the back of the chairs at the adjacent table. The menu has a nice variety of choices, but if you want fine food in a more private environment, I recommend eating elsewhere either before or after the show. That might also eliminate any service challenges of getting your food quickly, which is often a challenge at clubs like this, especially while the show is going on. The bar is in the lobby, so you can come early and enjoy some adult beverages before the show or bring them into the show with you. There is no bar inside the club, which cuts down on noise and activity while the comedians are performing. Unlike some other local comedy clubs, there is no drink or food minimum here. Ticket prices are reasonable, usually between $15 and $25 per ticket. Call about large groups or special parties. Tickets are general admission, not reserved seats. Like many comedy clubs, that means that the first people in will get the seats closest to the stage. There are some high tops against the side walls, and a few booths in the back. Get there early and enjoy cocktails and food at the Heckler Lounge outdoor patio.